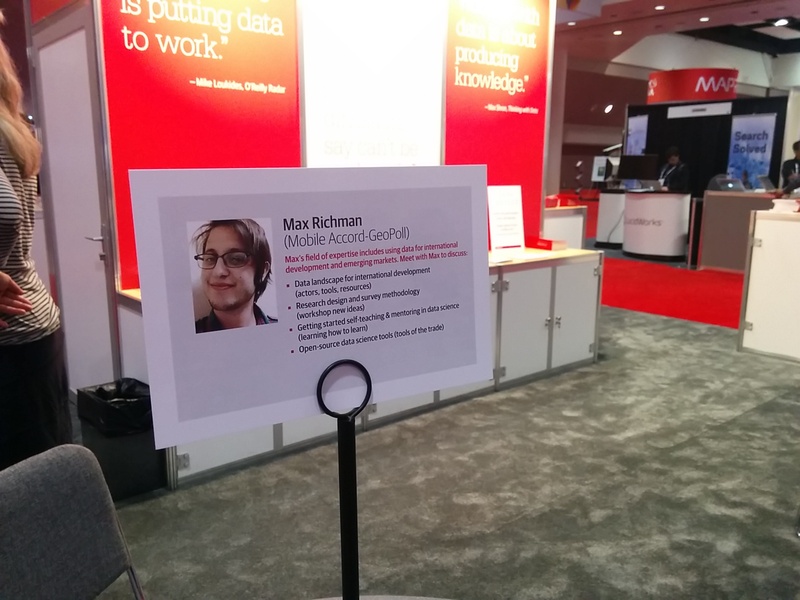 From February 11 to 13, GeoPoll chief Data Scientist Max Richman attended the 2014 O’Reilly Strata conference in Santa Clara, California. On Wednesday, he gave his talk about lessons learned at GeoPoll sending millions of surveys around the world. He also held office hours on Thursday to follow-up on interest from his talk. Below are some reflections on the conference. The Strata conference certainly lives up to its own billing and name. O’Reilly Media stresses that “Strata is more than a conference. It’s the essential training and information source for data science and big data—with industry news, reports, in-person and online events, and much more.” Strata attendees are offered layer upon layer of trainings, talks, and tutorials over the three day conference. In practice, “making data work” for many attendees means using creative math and engineering to quickly answer questions from large, often streaming real-time data sources. For vendors and many attendees at the 2014 Strata conference, “Big data” is not merely a business buzzword but their central infrastructure and intellectual challenge. There were talks from the biggest in the business on how “big data” impacts everyone, and what specific companies are doing with it. For example, Google engineers have built a 10-layer neural network that they claim can do any task that a human can do in 0.1 seconds, such as simple image classification. Twitter talked about the custom stack they have built to maintain and update 220 million time series every minute, making historical research possible in real-time. The exhibition halls featured hundreds of squawking vendors hawking their wares to representatives from a wide variety of high-transaction industries. I spoke as part of the Connected World track. Other Connected World talks provided useful frameworks for gaining insights by asking good research questions and creative ways to increase impact by encouraging colleagues act on your research insights. Building on the other talks about research and data, I was excited to present some of the insights we have gleaned from the millions of polls we have sent on GeoPoll platform. In a nut shell, my talk covered three game-changing tools for reaching the billions who are “offline”: surveys, dial-pads, and SMS. These tools are invaluable when organizations are trying to understand and assist audiences in developing worlds, who often do not have access to the Internet, and are hard to reach for in-person. I also discussed the current methods being used to collect data through surveys around the world, and, finally, what we’ve been learning at GeoPoll about the best ways to collect data from hard-to-reach places around the world. For example, in regions with low literacy like Afghanistan and Niger, we have found success using voice recorded surveys. In general, we have found that sending SMS surveys in mornings and evenings, as well as Sundays, to be among the best times to survey. Throughout my talk, I emphasized that while partnering directly with carriers and sending surveys through mobile phones can be tricky, by constantly testing, piloting, and running experiments we are building powerful panels to help our clients make informed decisions. After my talk, I had some great conversations with people working in similar markets reflecting on common challenges and opportunities. Many thanks to those participants and the organizers for making my week in Santa Clara so enriching.